Dogs of Hope Part 2 is a followup to the original Dogs of Hope: Long-Term Osteosarcoma Survivor Stories article that was published in 2004. 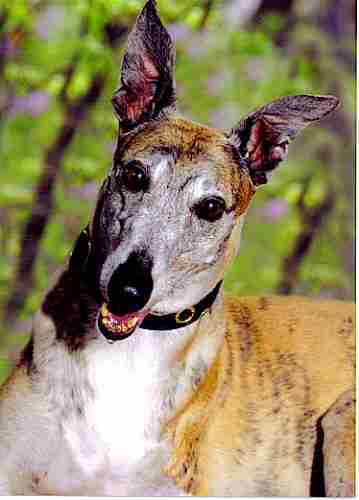 Since then, the treatment protocols and survival times for many greyhounds have improved. The success and failure rates depend on how soon the osteosarcoma is seen and then treated. With osteosarcoma, the sooner it’s discovered and treated, the better. We will add success stories as we find them. If you know of any or have a long-term osteo survivor in your house, we hope you’ll share your stories with us. 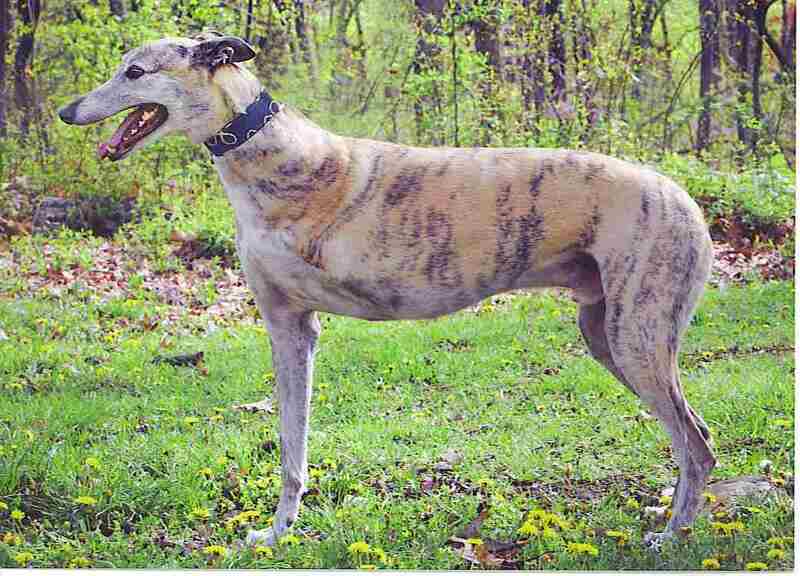 Aussie, greyhound of Suzanne Stack, DVM (whose articles are all on the Greythealth website), survived a very long time after his osteosarcoma was diagnosed and treated. At age five, Suzanne found Aussies’s osteosarcoma. She amputated Aussie’s left shoulder the day after she saw the osteosarcoma on an x-ray. Aussie received six carboplatin chemotherapy treatments, the first one only one week after the amputation. All in all he had six carboplatin chemo treatments plus 3.75 mg meloxicam tablets daily since the amputation; he had arthritis in the hock on the same side. Jaxen takes the time to smell the roses. We got Jaxen (Clown’s Jet) when he was eight years old. 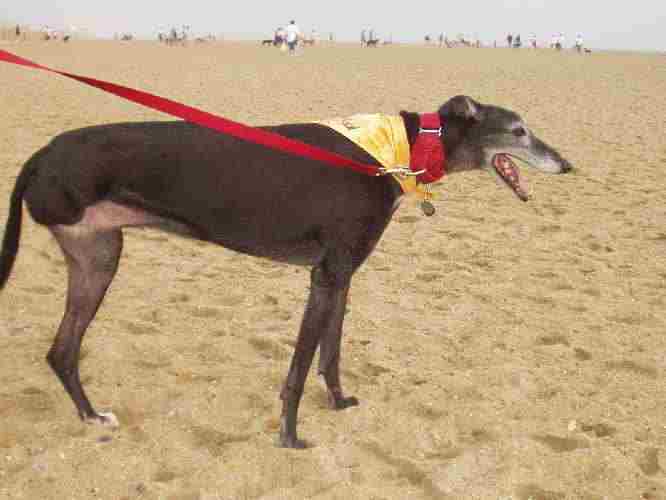 He had raced 100 races; he is listed on Greyhound data. He had been in a neglectful home for four years when we got him from a friend in North Carolina. (He was returned to a group that hadn’t adopted him out.) My daughter drove from Canada to North Carolina to pick him up. Eleven months later he was diagnosed with osteosarcoma. Within a week I took him to Ontario Veterinary College, a teaching hospital in Guelph Ontario where they amputated a rear leg. I sent three homeopathics prepared for him. – Arnica, Staphasagria and Hypericum. They gave these to him post op for three days and I continued at home for another three. He also had the “patch” and was on metacam for a week. He was in hospital for three days, two of which were in the ICU post operation. They got him up on the morning of the second day. 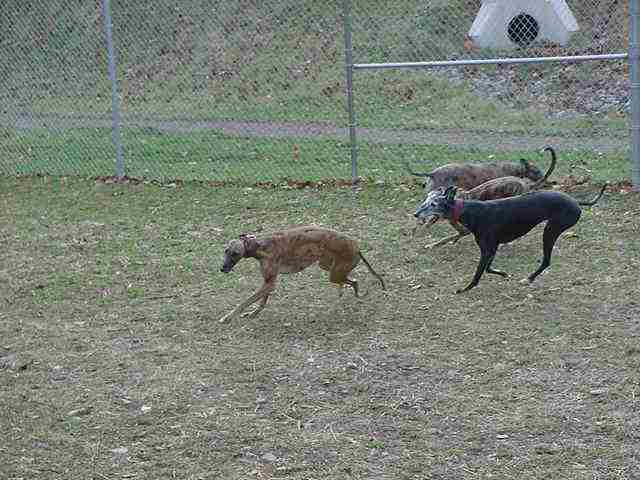 Some staff own greyhounds and they brought them over to the potty area because greyhounds LOVE other greyhounds. They said Jaxen’s tail wagged when he saw them. I didn’t see him until I picked him up on day three. He was thinner but jumped into the back seat of the car. My husband had removed the seat and the area was very well padded. Jaxen had six carboplatin treatments, which started three weeks post amp and every three weeks until finished. Before he treatment the local vet checked to be sure the white cell count was high enough. They gave him a thorough check over, weighed, and then took him into a room with two techs who specialized in doing chemo. Everything was sterile. He received it by IV. After he was done they kept him for about an hour and did ANOTHER thorough check up. Then he was released to us. The whole procedure took about 2 1/2 hours. ( The chemo takes probably a half hour.) He reacted VERY well. He didn’t miss one dinner and only one breakfast. There was no vomiting, no apparent nausea and no loss of weight. He was always *slightly * tired after chemotherapy, but I chalk that up to the trip there and back – three hours each way – and just the excitement and the loving attention whilst there. Carboplatin is supposed to be the “easiest” on the system and was recommended to me by Suzanne Stack. Fortunately, Ontario Vet College used only this at the time he was diagnosed with osteorsarcoma. I must say that they were super careful with him; none got on his skin. I know that chemo administration is very expensive but it wasn’t there; it was about $200.00 per visit because they are teaching hospital. If I ever had to do it again I would go the same route. After the amputation we fed Jaxen a low carb-higher protein diet. He had Innova EVO for kibble (about 1/2 cup a day ). Most of the rest of his food was home-cooked and or much of it was “human” food. His total food intake was about four cups per day and snacks. He got 100mg artemesinin every night just before bed with a dairy product, either cottage cheese (usually organic) or Stoneyfield plain yogurt. I believe that artemisinin extended his life. For breakfast he ate things like eggs, a variety of meats and cheeses (as little as possible with orange dye), garlic on his food, parsley, and more foods of that nature. For dinner he had a variety of food such as liver, heart, chicken, steak, hamburger, many types of fish, some veggies which he wasn’t really fond of, canned tuna, canned mackerel in tomato sauce), and salmon every couple of weeks. Spinach was one of his favourites. His blood count was low only once prior to his Carboplatin so I took him home and fed him a lot of liver and spinach. After one week the vet said of his blood count, “It’s high enough for 10 greyhounds!” He was given Vitamin E, CoQ-10, Beta Carotene, Ester C, UMAC CORE, L-Glutamine, and The 4th Herb (a tincture that is ESSIAC tea). I believe that L-Glutamine is a must. Tripods need to keep the muscle that they have; L-Glutamine can do that and, in some cases, can build a bit. He never lost his strength until a day before he died. Even on the day he was put to sleep, he hopped out to potty. Jaxen also had Laryngeal Paralysis. He had the tieback surgery 14 months before he died. I hand fed him meatball-sized pieces of his food for about 5 months. He did extremely well. I know that the next time I see him ( and my eight others ) it will be eternity. Jaxen and Pamela in 2007, three-and-a-half years post-amp and chemo. He lived another year. In the Spring of 2004, when she was 8 years old, Winnie stumbled on our outside steps. We didn’t think much of that, but several days later, we saw a lump low on her right hind leg. The vet thought it was suspicious, but did not want to rule out an old racing injury. Since Winnie had no other symptoms, and hadn’t slowed down at all, we hoped our vet was right. But a week later, the lump had grown, and our worst fears were realized when our kind vet came into the exam room holding the X-ray, her face grave. “It IS a tumor”, she said. What do you think when you hear those words? I was numb. Then I was scared. Back then, I knew little of osteo, but what I knew was that it was a death sentence. I think the conflicted emotions, the anger, the sadness, are universal, but everyone has to deal with that diagnosis in the way they feel is right for them, and most importantly, right for their dog. At first, we didn’t consider amputation. We live on the second and third floors of our big Victorian house, and rent the first floor. Winnie would have to navigate 23 outside steps just to get into our house. I’d never known a tripod before, and had no idea if she could adjust, if she would tolerate that handicap. In retrospect, we agonized too long over our decision. I wrote my beloved Queen’s “obituary” poem. I thought about how I would know it was “time.” But finally, we stepped away from our own emotions, and considered what Winnie would want, what would be best for her. And Winnie told us that she most definitely wasn’t ready to leave yet. So, about a month after her diagnosis, we decided to amputate. We weren’t sure what her recovery would be like, or how long she would be with us, but we knew we couldn’t take the chance of that leg shattering, and having to make a sudden, life or death decision. After the surgery, our vet decided to biopsy the leg for her own information, and the bone shattered. We knew we’d made the right choice. For many reasons, we decided against chemo, instead using artemisinin, fish oil, and a low carb, high protein diet. She came through the surgery well, and I steeled myself for the first sight of her without that leg. Yes, it can look like a horrendous surgery, but that bruising and swelling is soft tissue trauma, that fairly quickly returns to normal. She showed me that she was stronger and braver than I was when she got up and pulled me out of the vets to go to the bathroom. Our wonderful vet kept her for 5 days, and when she came home, we fixed up our tenant’s sunporch for her. It wasn’t ideal, but we somehow had faith that we’d done the right thing. Her recovery was remarkably smooth. She got stronger every day, going with me to work, and accepting all the attention that she so deserved. But she didn’t seem at all inclined to go up those 23 steps. About 3 weeks later, my husband was calling the other dogs to dinner. I was in the yard with Winnie, and before I realized it, she had started up the steps! I think she surprised herself too, making it all the way up, and standing there with a very self-satisfied look on her face. My heart burst with pride. And then I burst into tears. It would be another few weeks before she’d do the steps on a regular basis, but she did. She went up and down about five times a day for 3-and-a-half years, while I sometimes held my breath. She refused to acknowledge any sort of handicap, unless she was faced with something she truly didn’t want to do. Not something she COULDN’T do, something she didn’t WANT to do. Quirky, stubborn, stoic, resilient, and unexpectedly gentle and tender (when it suited her), she attracted attention everywhere she went. She pulled me down every street in Dewey Beach three years in a row. Winnie went to Gettysburg, Grapehounds and Mountain Hounds. She out ran her four-legged sisters, and was fearless, always impatient to be moving forward. Everyone who met her was slightly in awe of this sturdy black Greyhound with the thick, shiny fur, and her eyes on something in the distance. “Grace” and “courage” were the words most often used to describe her. I know she inspired many with her quiet determination, her “do what you have to do” attitude. I know she inspired ME. She taught me that every day is truly a blessing. It was about a week before Dewey in 2007 when we noticed that she was slowing down. She wasn’t eating like before and was reluctant to go outside. Then one day, she refused to eat, and she stumbled halfway up the steps and was unable to go on. I had to carry her, and it hurt us both, and scared us to death. Tests at the vets the next day showed she was in advanced kidney failure. Laying in the yard in the sun that afternoon, she told me, as clearly as if she’d spoken, that she was so very tired, and it was time to say good-bye. We believe she was in remission, and Winnie left on her own terms. She’d beat the monster, and I know she would have been proud. It was finally time to finish that poem. to go running with the Queen. Submitted by Barbara Heisey from her talk at the first Greyhound Health and Wellness Conference at Ohio State University Vet Hospital in March 2010. My Greyhound has cancer. Now What? Living with osteosarcoma. 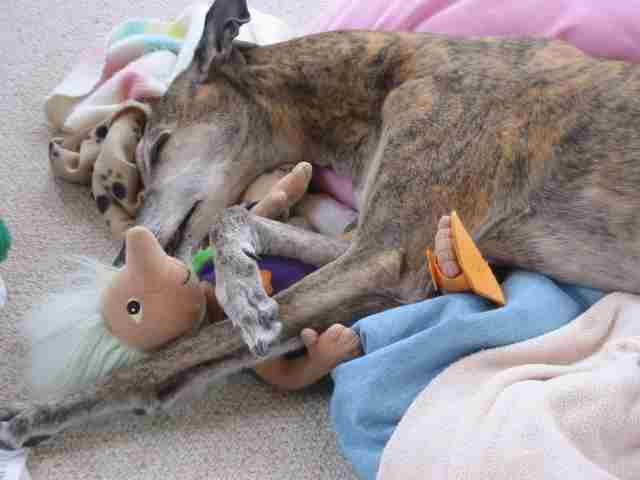 No news is more devastating than the diagnosis of cancer in a beloved greyhound. Here is my experience in dealing with this disease and the emotional and physical journey taken in seeking treatment. Learn about various treatment options and what to expect in the future regardless of whether you chose treatment or not. I first heard the word “BONE CANCER” in October 2005 when our then youngest greyhound “Bosha” was diagnosed with osteosarcoma after he had fractured his left front leg while running in the yard. We had, at first, thought he had had just tripped while running and playing. He was taken to an orthopedic vet where x-rays revealed the presence of cancer in the wrist joint. Here we had a 5 year old wonderful boy who had fractured his leg and was diagnosed with cancer. After consulting with our Vet – who in turn talked with Dr. Couto here at OSU about a special study that was being performed on retired racers with osteosarcoma, we decided on the amputation and chemo therapy for Bosha. He came through the surgery with flying colors and was accepted in the special study being performed here at OSU. He tolerated his chemo treatments well – traveling the 800 miles round trip to OSU from Pennsylvania for a total of five treatments. We had made a commitment to Bosha that we would get him the best care possible. Bosha lived his life no different on three legs than he did with four. He was full of love and lived everyday of his life to the fullest. He brought lots of HOPE and love to many greyhounds owners and their loving companions as they too faced the same hard decisions that we made so many years ago. Bosha lived just three months shy of his FOUR YEAR anniversary as a cancer survivor. In May 2009 he was diagnosed with a new bone tumor in his right rear leg – he was treated here at OSU with radiation and chemo therapy. As he was already a tripod amputation was not an option for him. On June 19, 2009 he was again enjoying himself in the yard, where he always loved to be, when his right rear leg fractured at the site of the new cancer tumor. The hardest thing I have ever had to do was to say GOOD-BYE to my best friend – someone who had made such a difference in my life and the lives of so many other people who loved him. The love and courage that he showed to so many people during his lifetime was amazing. I can only hope and pray that his tender heart and gracious soul will never be forgotten. The choices that we made for Bosha were the RIGHT Choices for him – They are many factors that come into play when making decisions for our hounds diagnosed with cancer. Please resource as much information that you can before making these difficult decisions. 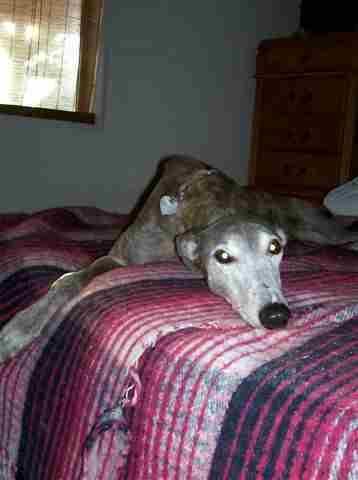 As I was left with a household of senior greyhounds at the time of Bosha’s passing I could only hope and pray that cancer would not touch our lives again, but that was not meant to be – unfortunately our 11 year old brindle boy J-Jay was diagnosed with osteo of his left front shoulder on 12/9/09. After much soul searching and knowing him as I did – since he had been a part of our family since he was one year old – we decided once again on amputation and chemo. His surgery was performed on 12/17/09 and he received his first chemo treatment on January 4, 2010. J-Jay lost his battle with osteosarcoma on June 11, 2010. Again – this decision was made based on many factors unique to J-Jay and his general health. Everyone’s circumstances will be different with different decisions and different outcomes. We can only hope that you, as greyhound owners, never need to make these heartfelt decisions for your loving companions. Please know that you are NEVER ALONE and that there is ALWAYS HOPE. Unfortunately we all need to consider the financial stress of dealing with cancer and one of the factors to consider. 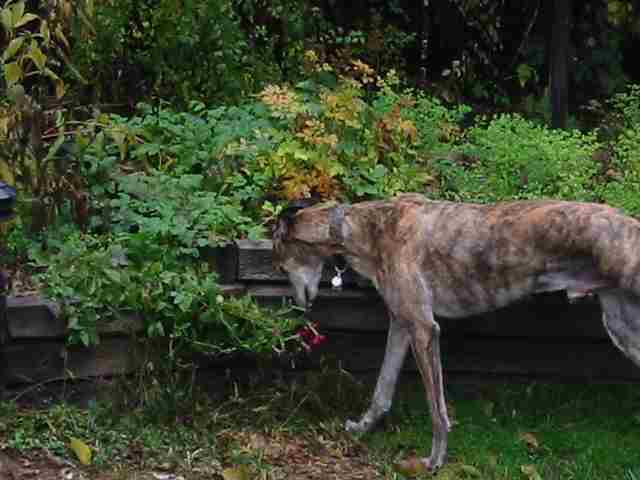 Other considerations include the age and overall general health of your greyhound. There are several resources which I found helpful during the course and treatment of our greyhounds with cancer. Greyhound Health and Wellness Program here at OSU. IT IS IMPORTANT TO NOTE THAT OSU WILL PROVIDE FREE CHEMOTHERAPY DRUGS TO ANY RETIRED RACING GREYHOUND. This helps with the financial responsibility and concerns. 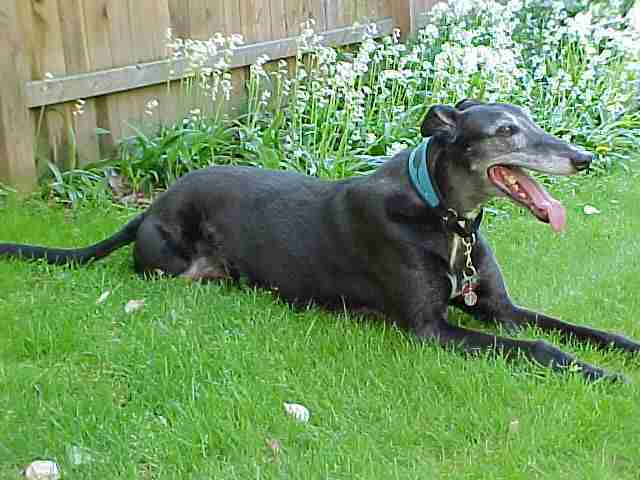 There are many websites available on line to resource information about greyhounds. Please don’t limit your resources in gaining the knowledge needed for your specific situation. Thank you all for allowing me to share my story with you. Those are some amazing stories. I have had a couple of scares with my greys, and hope that I never experience osteo. I love my hounds every day, you never know when it will be your last.